Sam Franklin relies upon four decades of legal experience in high-profile cases across the country. 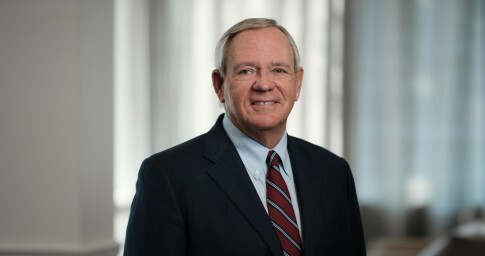 During his 46 years of practice, Sam has handled numerous jury trials across a wide range of areas, from personal injury and wrongful death cases to complex business disputes. Among many high-profile cases over the years, he argued for Auburn University when the state of Alabama prioritized K-12 education over higher education in the proration funding crisis. Sam has also represented R. J. Reynolds Tobacco Company and other manufacturers in smoking and health litigation, and he defended ExxonMobil when the state of Alabama sought to impose punitive damages in a dispute over the calculation of royalty payments. Sam co-founded the firm in 1990, when class actions were booming and Alabama had some of the country’s toughest anti-defense jurisdictions. He helped lead the firm through this era and beyond, securing numerous early wins and establishing a unique culture. Sam and his co-founders created a structure that shortened the path for younger partners to earn the same as senior lawyers. They also established a flexible structure to better accommodate women in the workplace — resulting in the firm’s solid track record for gender diversity. In recognition of his role in establishing an innovative firm, The National Law Journal named Sam a 2017 “Elite Boutique Trailblazer.” That culture and growth continues to this day, as Lightfoot has become a renowned litigation firm across the country. Sam is a Fellow in the American College of Trial Lawyers (ACTL) and served as its 68th president from 2017-18. He has previously served on the ACTL Board of Regents from 2009-13, as secretary from 2014-15, as treasurer from 2015-16 and as president-elect from 2016-17. He now serves as immediate past president. Sam received the Peter Perlman Service Award as a Fellow of the Litigation Counsel of America. In 2006, he received the Commissioners Award from the Alabama State Bar recognizing his service to the profession. Sam is a proud native of Brewton, Alabama (population: 5,432). He is married and has two daughters, two grandsons and one granddaughter. Participating in a a two-week commercial arbitration administered by the AAA. Defending a legal malpractice claim in Mississippi. Trying a long-term chemical supply contract dispute before a jury. I never forgot those words. I hoped I would never have to impeach another witness. Of course, that feeling didn’t last long. The lesson I learned is that when a witness does change his story, you must approach him with extreme caution — making a good faith effort to show the jury that you are giving the witness every opportunity to get it right. Impeachment can be a powerful tool in the hands of a skilled trial lawyer. But sometimes knowing when not to use it is just as important.